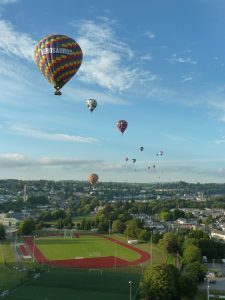 TIVERTON’S Two Rivers Festival (2RivTiv) is taking place next month and this year it features hot air balloon rides! In place of the annual Tiverton Balloon & Music Festival which won’t be going ahead this year, Aerosaurus Balloons are proud to be offering Hot Air Balloon flights from the 2016 2RivTiv Festival. Tickets are available to new or existing passengers for rides on Saturday 9th July in the morning or evening, and for flights on the morning of Sunday 10th July. To reserve your place on a balloon visit the Aerosaurus website or call the booking office on 01404 823 325. 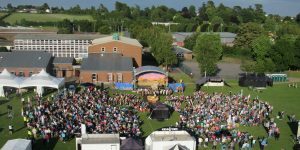 The festival takes place in the grounds of Tiverton High School (Bolham Rd, Tiverton EX16 6SQ) and runs from Friday, July 8 to Monday, July 11. One of the successes of last summer’s festival, held in the grounds of Tiverton High School, was a performance of ‘The Lion King’ by local young people. This year, more than 500 local children will perform an outdoor production of Disney’s ‘The Little Mermaid’. Another highlight of the TwoRivTiv programmed will be an outdoor production of William Shakespeare’s ‘Hamlet’ to mark the 400th anniversary of the playwright’s death with a ‘bring your own picnic and deckchair’ theme. This year’s event runs from Friday, July 8 to Monday, July 11. 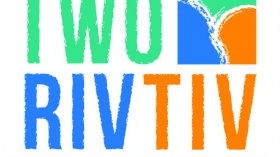 Tickets for 2RivTiv are available from The Busy Bee, Fore Street, Tiverton and Tiverton Tourist Information. Tickets can also be purchased online from www.TCLP.org.uk.